At the close of the agenda no apologies had been received. a) confirm the ordinary minutes of its meeting, held on Monday, 3 December 2018, as a true and correct record. 1. 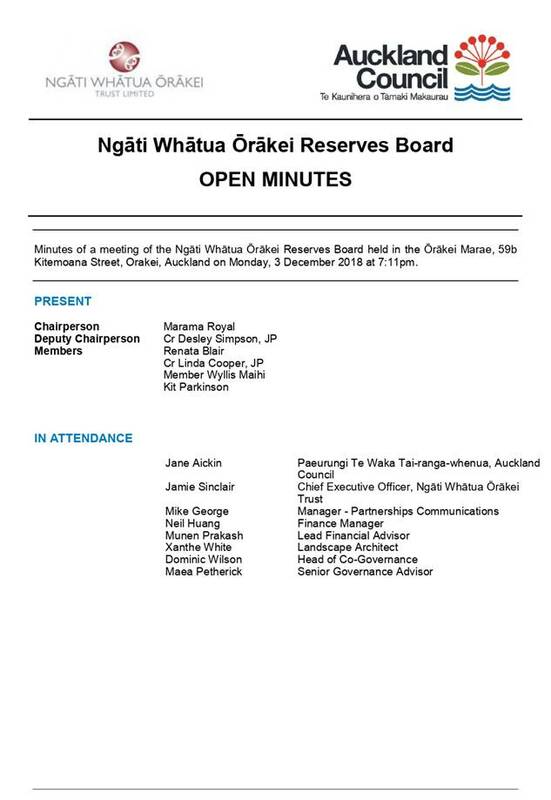 As per the Board’s request, attaching a copy of the minutes of the Ngāti Whātua Ōrākei Reserves Board meeting, held on 3 December 2018 – Attachment A.
a) note the minutes of the Ngāti Whātua Ōrākei Reserves Board meeting 3 December 2018. 1. 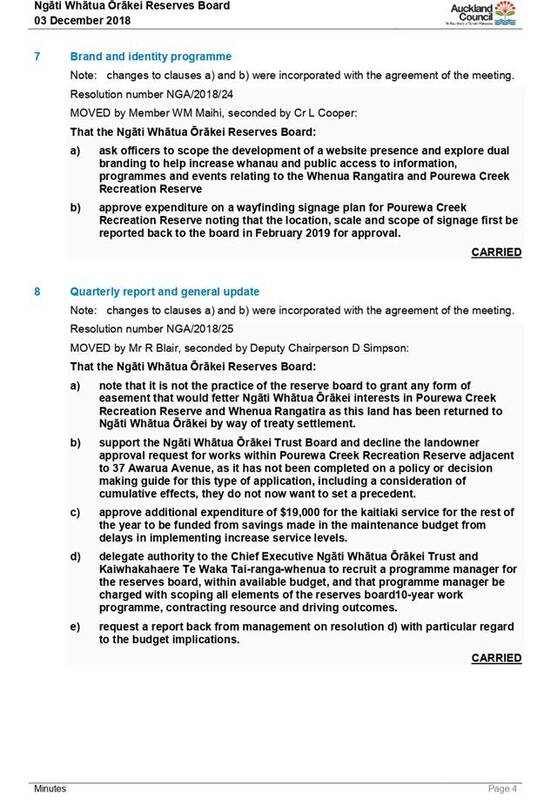 To update the Ngāti Whātua Ōrākei Reserves Board (reserves board) on the operational and capital work programmes for the Whenua Rangatira and Pourewa Creek Recreation Reserve. 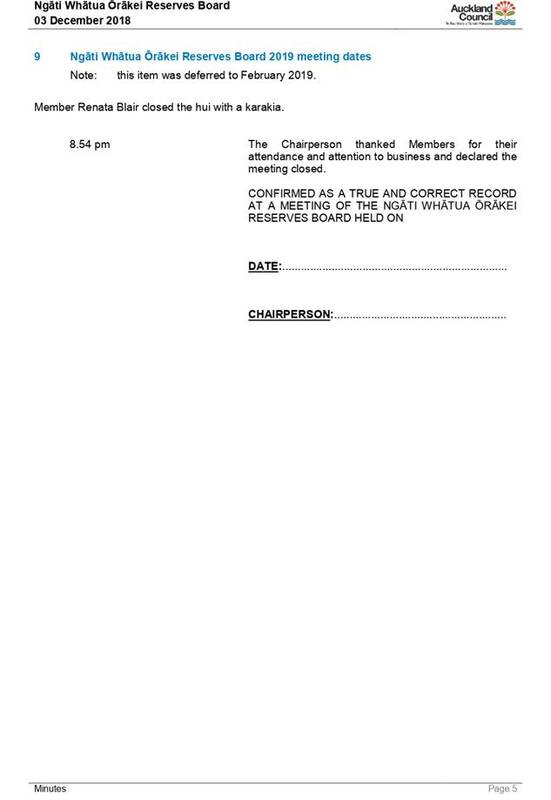 a) approve the reforecast of $3,233,200 into the middle years of the Ngāti Whātua Ōrākei Financial Plan 2018-29, as shown in attachment A of the agenda report. 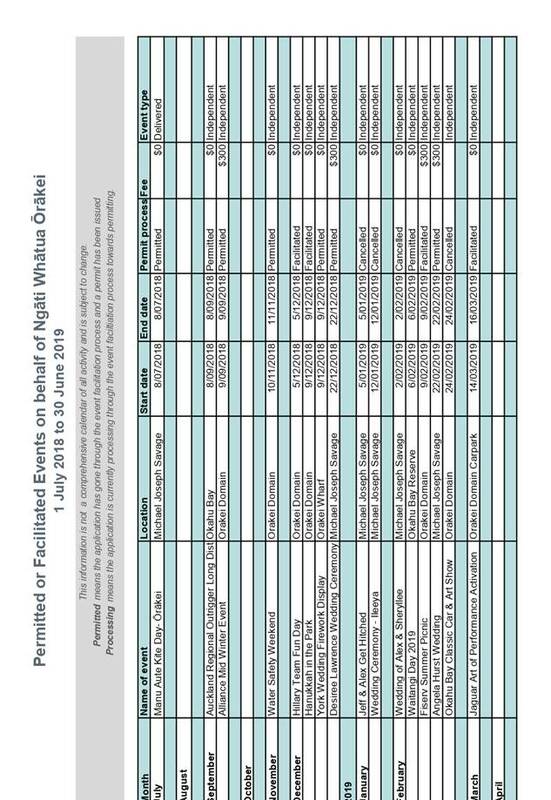 b) note: the reforecast is driven by a number of capital projects being delayed due to their dependency on the endorsement of the Ōrākei Visual Framework and the review of the Whenua Rangatira and Pourewa Creek Recreation Reserve Management Plans. c) delegate to the Chair and Deputy Chair the authority to approve the detailed scope of signage works on Pourewa (following the completion of a wayfinding report). 2. 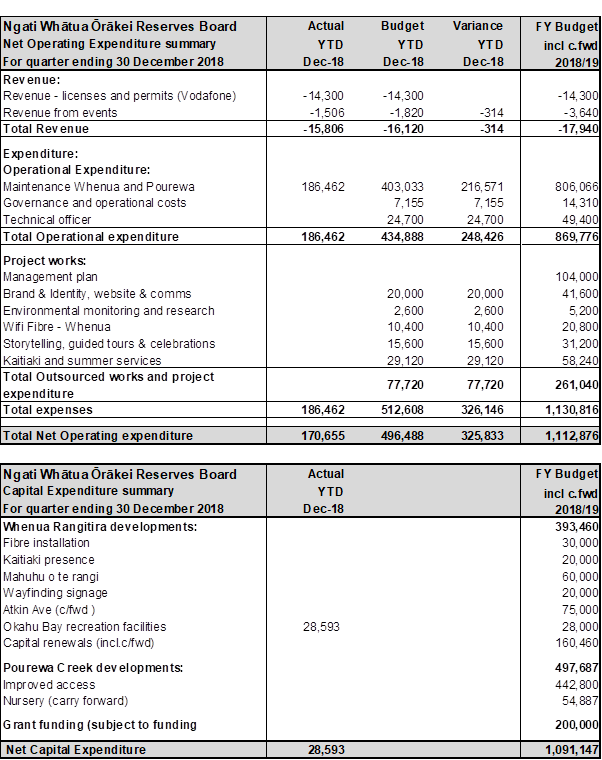 An overview of the operational and capital expenditure for the financial year to date (up to the end of second quarter) is included in the table at the end of this section. 3. Revenue received is on target while operational expenditure continues to be behind plan. This is primarily due to the additional budget provision allocated to new maintenance works on Pourewa Creek Recreational Reserve starting later than planned and taking some time to gear up. 4. Ōkahu Rakau have commenced a maintenance programme on Pourewa and they are currently working with Council staff to agree the next priorities to vary into the maintanance contract. Despite this a forecast maintenance underspend is expected at year end. 5. In addition to maintenance, there are forecast operational underspends at year end in governance and operational costs, management planning, celebrations, brand and research. The year end operational forecast is currently under review as there are a number of workstreams that are currently in a state of change. Notwithstanding this we are expecting about $250,000 favourable operating expenditure at year end. 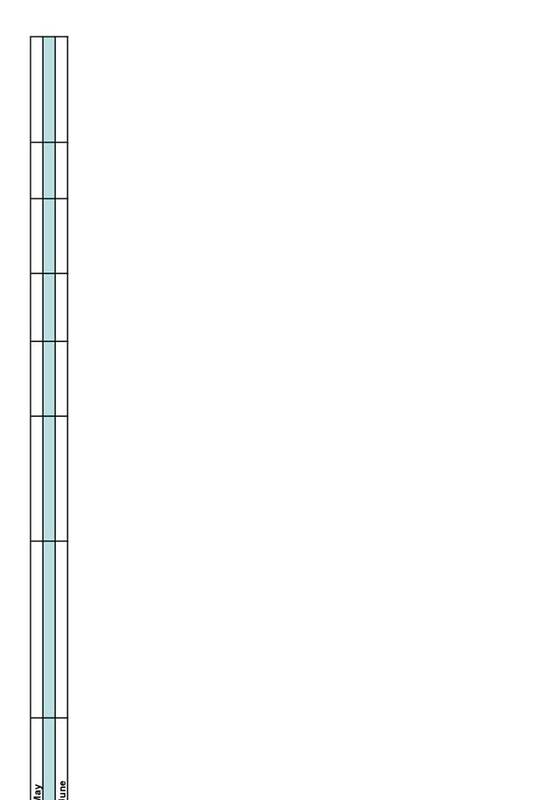 This will, in part, offset the costs identified in point six below. 6. 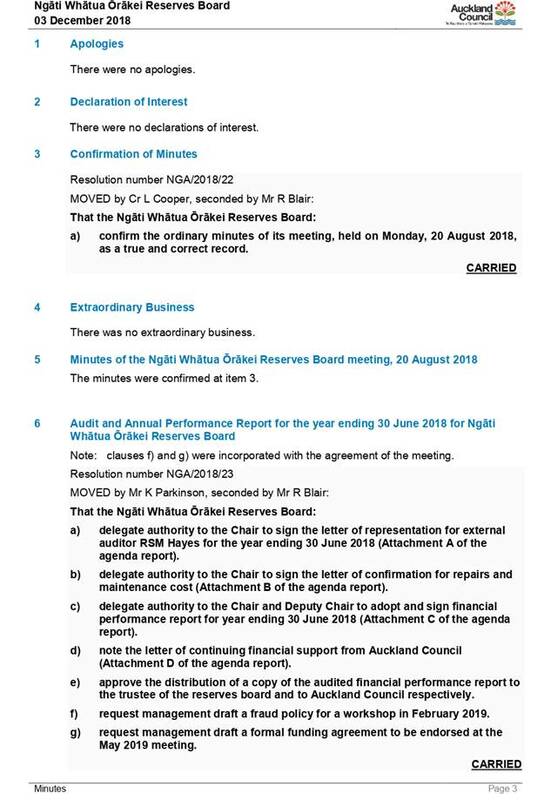 In December 2018 delegation was given to the Chief Executive of the Ngāti Whātua Ōrākei Trust and Kaiwhakahaere Te Waka Tai-ranga-whenua to recruit a programme manager for the reserves board, within available budget. At the time of writing this report a contract programme manager is about to be appointed and will be funded from the forecast operational underspend in 2018/19. As directed by the reserves board the programme manager is being charged with scoping all elements of the reserves board10-year work programme, contracting resource and driving outcomes. They will also be responsible for recruiting the long term resources needed to continue to drive the overall work programme. As a contract programme manager they will draw on the resources and support needed from their parent company. The forecast budget for this work is $150,000. 7. Capital works are behind plan. The Ōkahu Bay Recreational Facilities are now complete and the Atkin Ave water quality project is well underway. Both wayfinding and roading/pathway projects are in early planning stages. At the December 2018 meeting the reserves board discussed the need to get endorsement of the Ōrākei Visual Framework and follow this with a review of the management plan before other elements of the capital works programme can be progressed. 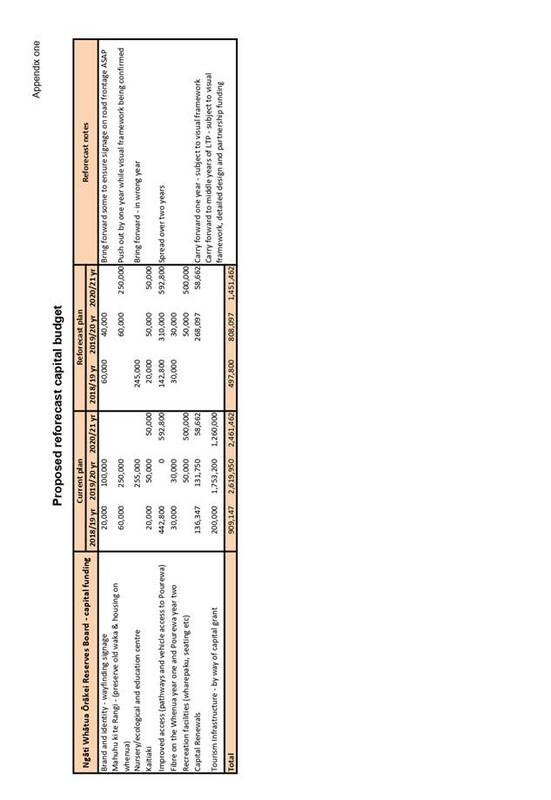 As such it is recommended that the reforecast capital budget, shown in attachment one, be endorsed. 8. Below is an overview of forecast projects with an indication of their progress against agreed milestones. Further commentary on many of these is provided later in the report. 9. This project was approved several years ago. 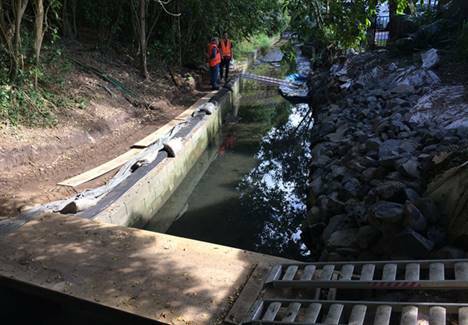 The project scope involves the management of erosion adjacent to residential neighbours and daylighting and improving parts of the stream running along the boundary of the Whenua Rangatira and Atkin Ave. Following scope changes, funding challenges and weather delays the project is now well underway. The project team will be working into late March to complete the project. 10. The resource consent was granted in January 2019 for the Nursery. Staff are now working on the next phase of project planning and will provide a more comprehensive update at the May meeting. 11. 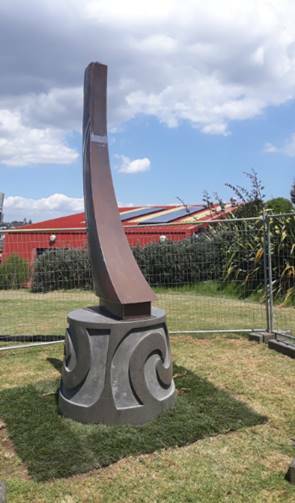 The Kohimaramara Pou has been successfully installed beside Takutai Moana (the depot) – see images below. An unveiling is being arranged. 12. Work has been commissioned on a wayfinding plan that will identify and recommend the nature, scale, number and overall scope of signage proposed on Pourewa Creek Recreation Reserve. Delegation is sought for approval to sign off the scope of signage works on Pourewa (following the completion of this report). This will enable signage to be commissioned as soon as possible. 13. 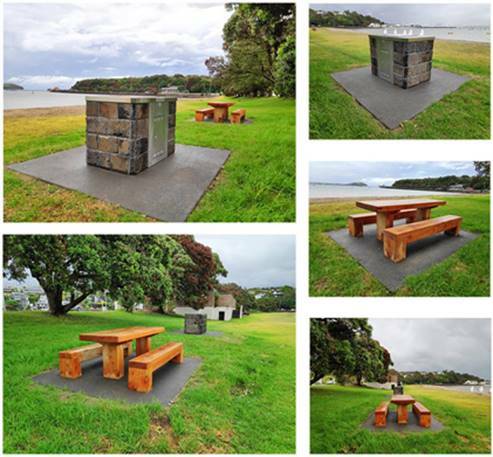 The BBQ and picnic table at Ōkahu Bay were installed in December ready for the busy summer months. 15. The Ngāti Whātua Ōrākei Mana Whenua Kaitiaki Service has been successfully operating over the summer period. After experiencing some initial administrative delays the service has established itself very quickly and has settled into the landscape and environment seamlessly. Neil Maihi reports that the high profile Kaitiaki hub has “been like a magnet for our manuhiri and public to engage with our Kaitiaki”. 16. Neil advises that the feedback from the public and regular tour operators has been extremely positive. The operators have repeatedly expressed their appreciation that there is a formal presence and measures in place to monitor and manage the range of issues on the Whenua Rangatira. The biggest and most repeated comment is that the public love the litter free cleanliness of the area (thanks to our Kaitiaki and Ōkahu Rakau facilities management team). 17. The Kaitiaki have engaged and established a working relationship with some of the groups where there have previously been some issues and have managed to negotiate and maintain a very minimal presence or impact from these activities. 18. The “boy racer” groups have, until recently, been cooperating however there was one serious incident in early February that has had an impact on the public and tourist operators. This incident occurred outside of Kaitiaki hours but is being followed up. 19. Kaitiaki staff are currently working from 0700 until 1600 in the weekends and public holidays. They have observed patterns and waves of visitor numbers with families moving onto the beach and reserve areas later on in the day (tides dictate activity) and often crowds are saying beyond the Kaitiaki finish time. 20. Neil Maihi has been returning to the beach and whenua after hours taking photos of the mass of visitors still on the reserve and beach up until 9pm. It is recommended that hours are extended in the future to ensure coverage until most visitors leave (to be considered in a future report to the reserves board). 21. Toilet facilities at Michael Joseph Savage (not on the Whenua Rangatira) are proving to be deficient. One hour after the cleaning team have visited the toilets they are in need of servicing again and the sheer numbers of visitors verses the available facilities is disproportionate. It is recommended that this be addressed as it is the most constant and regular complaint from operators and visitors alike. Draft ideas for the future of this area are due to be discussed with the whanau and community and could include increased tourism facilities. The only short term option to address this would be to install port-a-loos or restrict numbers. It is recommended this insight be taken into account as the reserves board progresses the visual framework for Ōrākei and the budget for 2019/20. 22. Overall the season has been very successful with the brand and profile being positively received. The Kaitiaki service has been well established in the local community providing information and peace of mind for those regular users, visitors and operators. The team is developing into a professional cohesive unit and have become a part of the regular landscape. Neil comments that “it feels so very natural to be here on the Whenua, we thank you for you continued and ongoing support”. 23. The Waitangi Day event at Ōkahu Bay was once again the highlight of the annual event calendar. At the time of writing the event was yet to occur and a post event report will be provided. In line with delegations verbal approval has been given to fund the Mauri tent which tells the story and history of the Whenua Rangatira. 24. A range of other event activities occurred/are due to occur over the summer as show in attachment one. · The Whenua Rangatira has been very well utilised by the public this summer. We have received complaints about the cleanliness of the toilets which has resulted in our contractor increasing the frequency of cleaning. · In December one of the BBQs needed a maintenance overhaul however during this time the new BBQ was commissioned along with the new picnic bench which eased the impact of this. Both of these facilities have been very popular over the summer. · The embattlements/encampment structures on the north face of the Whenua Rangatira land have become unsafe due to flaking and falling concrete. They have been fenced off to restrict access and warning signs put in place to discourage people from trying to force entry. The encampments are being assessed by Council internal assessors to determine what works are required to make them safe. · New line marking has been put in place at the top of the car-park at Hapimana Street to ensure cars and buses know where to park. The bus companies have contacted us to thank us for putting this marking in place and making the area safer. 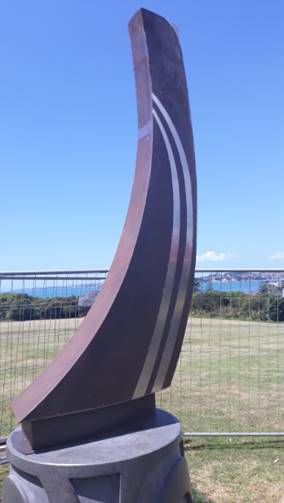 · The bedding plant display within the Michael Joseph Savage Memorial gardens has been stunning with many compliments received about how beautiful and well maintained the area is. · The new General Manager, Thomas Irvine, has recently been welcomed to the Ōkahu Rakau team. · Ōkahu Rakau staff meet with the Morphum team to support the Atkin Ave creek works. A mihi whakatau and karakia was undertaken before work commenced. The Ōkahu Rakau staff are visiting the site each week to get a update and provide support where needed. 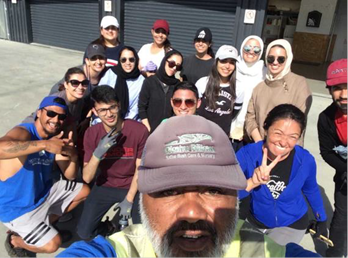 · Ōkahu Rakau staff received three thank you cards filled with appreciation and gratitude from Qatar volunteers that recently supported work on the whenua. · Ōkahu Rakau continue with bee keeping as part of ecology and manaaki for the whenua. 25. No incidents or near misses have been reported over the quarter.